I am taking a break from posting next week due to a little traveling, so this week: two tracks on obscure labels from West Africa! Music from Liberia, in Liberian languages other than their official language of English, is some of the toughest to track down on 78 rpm records. In fact, I’m almost ready to say that nothing was released on commercial labels until the 1950s. There were, however, some important field recordings of ethnographic and popular “café music” made by ethnographer Arthur S. Alberts. Alberts titled his collection of twelve 78s “Tribal, Folk and Cafe Music of West Africa” and it featured music recorded in French Guinea, “The Gold Coast,” Burkina Faso (rare for that time, as well), French Soudan, and Liberia. The recordings were made in 1949, and were collected in a box set of 12 78rpm records with a 20+ page booklet and a set of black and white photographs taken on the expedition, in a limited edition of 2,000. One could order the set from an address in New York City for a total of $25.88. Those recordings, as well as many unreleased recordings Alberts made on his travels, are now available on CD in three collections (Pearl, Folkways (discontinued), and Yarngo). Anyway – getting back on track: in the 1950s or so, a strange little label appeared named Palmo Tone, which only released Liberian music, it seems. The records were pressed in England for something called “A.M.S. Ltd.” And while this piece is by an Apostolic Church Choir (40% of Liberia is Christian) don’t assume this sounds like a westernized group of singers going through a British hymnal – it sounds nothing like it. In fact, everything I’ve heard on the Palmo Tone label is raw, almost ethnographic sounding – a far cry from the café music of the Alberts set. This piece is sung in the Bassa dialect (not to be confused with the Bassa dialect of Nigeria, or the Bassa (Basaa) dialect of Cameroon). Who knows how many records were released on the little Palmo Tone label? At least 60, as far as I can tell. The second piece is a subtle, methodical guitar and voice piece in the Jula language (listed as Dioula on the label). Jula is spoken primarily in Burkina Faso, and also in Côte d’Ivoire. 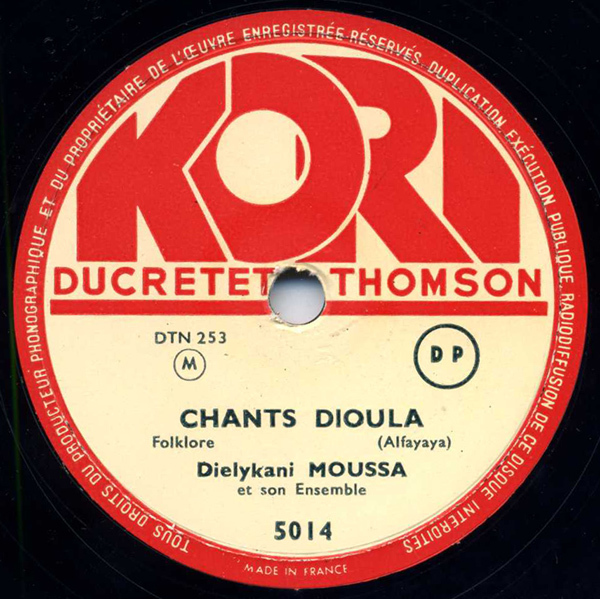 Unfortunately, I know virtually nothing about the singer, Dielykani Moussa, or the label (other than that it seems to have been a possibly-short-lived subsidiary of Ducretet-Thomson) and its nice design. I am most curious about where this track was recorded – my personal hunch is that it was recorded in the mid-1950s in Côte d’Ivoire, but I really can’t say for sure. Thanks to reader ‘kabako” we know that the title, Alfayaya, refers to Alfa Yaya of Labé, the Guinean ruler of the Fula people, who was deported to Côte d’Ivoire in 1905. I just wanted to express my gratitude for this blog and the music it makes available to us all. Many thanks. Fantastic, in every sense. Many thanks, as ever. Here’s a bit of a random thought on the second disc. The word usually rendered in English as “Jali” is rendered in French as “Djely”, or sometimes “Diely”. Is it possible that this might hint at a connection between Dielykali Moussa and names like Diely Moussa Kouyate, Djely Moussa Conde and Djely Moussa Diawara (or Jali Musa Jawara, as it’s written by English speakers)? Or am I just rambling? I realise this would connect it with the wrong country altogether! rootlesscosmo: Thanks very much for the kind words. God these are amazing. Thank you! Moussa is quite a common name in all Mandé countries (it is no doubt a Malinké version of an Arabic/islamic name, – but I don’t know which). The “djeli” (in any spelling) refers to the profession of griot and is often added to the first name. Keita Fodeba had a terrific influence on West-African music. Even Ali Farka Touré named him as a key influence. Indeed, both names are quite common. And Fodeba’s influence is certainly widespread (and he had a fascinating life story as well). I may post a Fodeba 78 in the future…thanks for checking in. 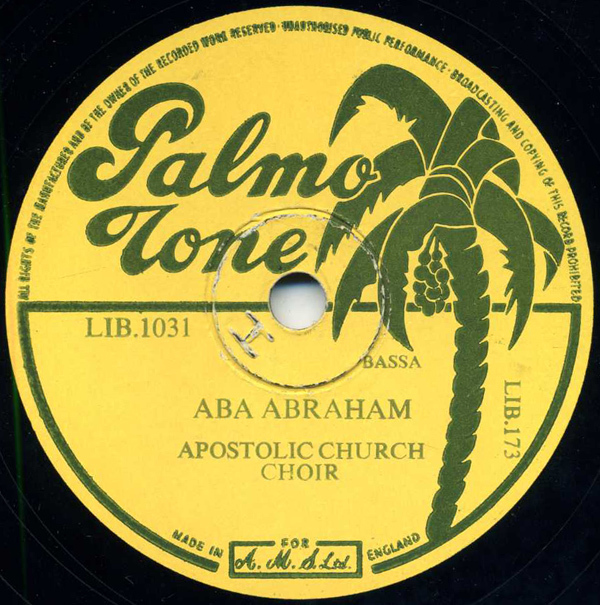 After living a couple of years in Liberia in the fifties, I happen to have a Palm Tone record 78 of the group John Belove and the Apostolic Church Choir. The songs are; Dehmbrieh and GO-OH. Do you have any more information about this record. I can not find any information anywhere. Hello Nils – Great question. I can’t help you much personally, but perhaps others can chime in. I have several Palmo Tone records, but know nothing about the artists and what I know about the label, I wrote in the post. I find it very interesting that, since you have LIB.1106, that would seem to indicate there were at least 106 records released on that label. They don’t turn up much, that’s for sure. I own a copy of the original box set of the Alberts collection from 1949. The shellac is glossy and looks unplayed; all photos and booklet are included; the only flaw is a small tear on one of the outer binding of the three booklets containing the records, and some shelf wear on the box. The set is hand numbered (in ballpoint pen!) 861 of 2000. I’m a casual vinyl collector but 78s are not my specialty. I’d be interested in selling this set and could send some scans of it. Yes, it is clearly the melody and lyrics of the song refering to that king. BTW: the national anthem from Guinée (Conakry) is inspirede by thsi song, as well. Thanks for the wonderful information – I will update the post. This post is quite old and not updated – I expanded information in later posts. Much appreciated!